Pulp Stones are calcified masses appearing as nodules in the coronal or the radicular portion of the pulp tissue. Pulp stones are said to be seen in at least 50% of the teeth in the oral cavity. They go unnoticed as they are small in size in most of the cases when the calcifications become large they are called as Denticles. Pulp Stones are a headache during Root Canal Treatment as they in most cases lead to obstruction of straight-line access into the root canals. Under Classification by Structure, the difference is due to the morphological shape and make of the calcified structure and not the chemical make up of it. True Pulp stone or Denticle: These are very rare and are a True denticle is made up of dentin and is lined by odontoblasts. These are located close to the apical foramen. The presence of the remnants of epithelial root sheath within the pulp leads to the development of a True denticle. With the inclusion of the epithelial root sheath cells induce the cells of the pulp to differentiate into odontoblasts which form dentin masses called true pulp stones. False Pulp stone or Denticle: These are called false denticles as they appear within bundles of collagen fibers appearing as concentric layers of calcified tissue. False denticles can be formed due to calcification og thrombi in blood vessels and may be seen around vessels. The size of the denticles is small initially and increase in size incrementally with growth seen on their surface. This type of pulp stones is also called as fibrillar or linear calcifications because of their longitudinal orientation. 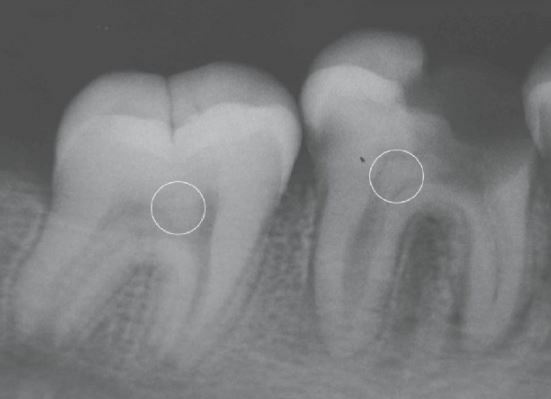 Location of Diffuse pulp stones is found in root canals and sometimes seen in the coronal portion of the puas wellell. They are aligned close to the blood vessels, nerves or collagen bundles. Free Pulp stone or Denticle: These are termed as free as they are surrounded by pulp tissue and not fused to dentin or any hard tissue. Attached Pulp stone or Denticle: These are termed as fused as they are partially fused to dentin. Embedded Pulp stone or Denticle: These are termed as Embedded as they are surrounded by Dentin completely on all sides, these are seen more in older pulp tissues. The reason might be due to increase in the extent of cross-linking between collagen molecules. 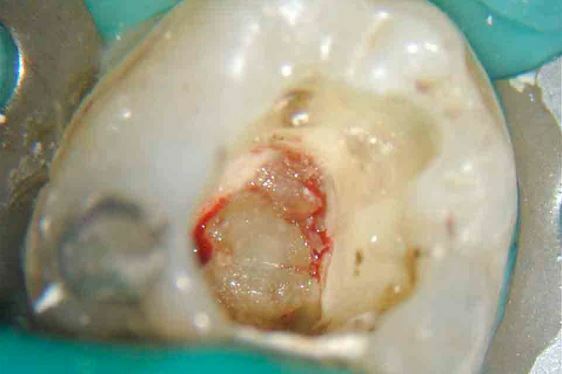 The presence of pulp stones changes the anatomy of the pulp chamber completely as they might obstruct the entrances to the canals. As pulp stones are caused due to chronic irritation the number increases in case of prolonged irritation and this can alter the original shape of the pulp chamber. The shape of Pulp Stone is irregular and the size varies as well which makes it that much more difficult to locate and negate the pulp stones. It has to be decided then and there whether to try and remove the pulp stone or to bypass it as large pulp stones can be close to the margins and in an attempt to remove then can lead to a perforation. Depending on the size of the pulp stone, we can see partial or complete obliteration of the pulp chamber. The Pulp chamber appears to be darker in hue while viewed on the Xray. In cases where the Pulp stone completely obliterates the pulp chamber, the pulp tissue is present but to a minimal extent making it quite difficult to get a clear idea with the Xray about the pulp chamber and the location of the root canals. The presence of Pulp Stones does not mean that the tooth requires any treatment or intervention with Root canal treatment. The tissue changes in the pulp with calcific metamorphosis does not require Root Canal treatment if there is no periapical inflammation. Make sure you have any sort of magnification, if you cannot afford a microscope it is important that you at least have Loupes to help you in differentiating between normal dentin and a pulp stone. The pulp stone appears slightly darker in hue as compared to the tooth structure, usually, the pulp stone is slightly yellow and if you dry the access cavity properly you can notice that the stone is usually shiny when compared to the surrounding dentin. In most cases, the pulp stone does not have pronounced borders when you start your access preparation because of its irregular shape and size. It is important to identify using any magnification appliance like a Microscope or Dental Loupes the size of the Pulp Stone and decide whether to bypass it or to remove it, it also depends on the location of the stone whether it is blocking the canals or not.